Holding the check, from left to right, Randie Toto (Casey’s General Stores store manager), Mike Richardson (Casey’s General Stores Vice President of Marketing), Robin Kelleher (Hope For The Warriors President and CEO) and Terry Handley (Casey’s General Stores President and CEO) surrounded by Casey’s General Stores and Hope For The Warriors team members in Siloam Springs, Arkansas. ANKENY, Iowa (Jan. 17, 2019) – During its seventh annual dog tag campaign, Casey’s General Stores raised more than $845,000 for Hope For The Warriors®, a national nonprofit dedicated to restoring a sense of self, family and hope for veterans, service members and military families. 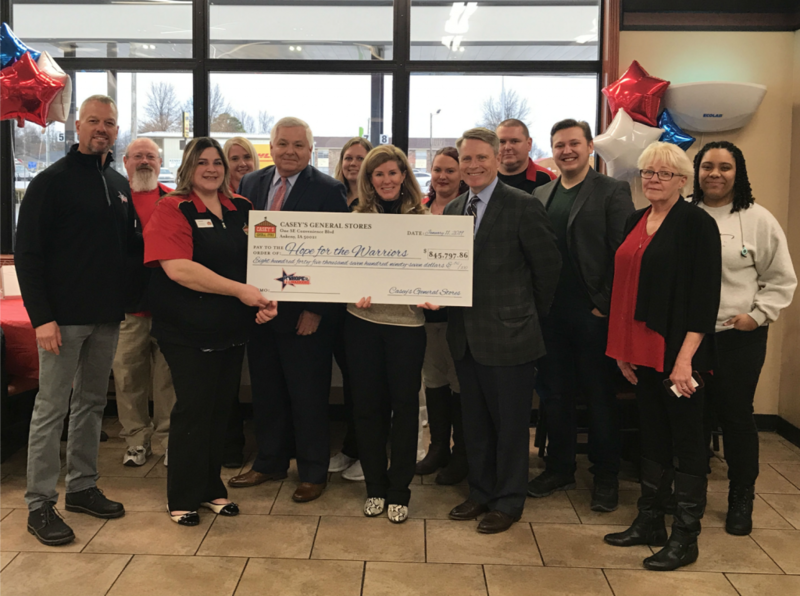 The check presentation took place at the Siloam Springs, Arkansas Casey’s store – the location that collected the most donations. During the month of November, customers of Casey’s General Stores purchased $1 dog tags that were displayed throughout the store. Collective efforts from the more than 2,000 stores located in Arkansas, Illinois, Indiana, Iowa, Kansas, Kentucky, Michigan, Minnesota, Missouri, Nebraska, North Dakota, Ohio, Oklahoma, South Dakota, Tennessee and Wisconsin raised $845,797.86. Funds will benefit veterans, service members and military families through a variety of programming including clinical health and wellness, sports and recreation and transition services. In seven years of supporting Hope For The Warriors, Casey’s General Stores have raised more than $4 million. Casey’s General Stores is a Fortune 500 company (NASDAQ CASY) operating 2,000 convenience stores in 16 states throughout the Midwest. Casey’s strives to consistently deliver quality gasoline, freshly-prepared foods, clean environments and friendly service at every retail location. At Casey’s General Stores, customers can enjoy famous, made-from-scratch pizza, donuts, other assorted bakery items and (at select stores) Casey’s made-to-order sub sandwiches. Casey’s is currently the fourth largest convenience store chain, and the fifth largest pizza chain in the United States.